Description: Santa Fe eastbound at the east end of Woodford siding. Description: Eastbound works upgrade at East Woodford. Title: BNSF 519 AFTER WRECK IN NIOTA IL. Description: Love the spiffy lettering on the sides! Description: A CSX Autorack Train Passes Cumberland, MD. Description: Exiting the Midway Intermodal yard under the Snelling Avenue bridge. Description: BNSF and UP share the Colorado Springs yard. Description: NS 048 Ringling Bros. 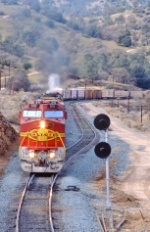 Train running on an approach light behind 212. Description: BNSF 519 leading a unit grain train across the Valley City bridge. 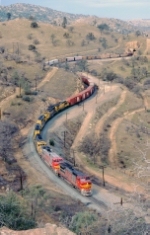 Description: W SBDSBD1-02 With BNSF 519, BNSF 8612, BNSF 567, & BNSF 8606 parked in the "Mountain Man Spur". This was a great consist. One day all these paint schemes will be gone. Enjoy them while you can. Photographed at 10:30. Description: Oddly enough, I've built a model of this unit. Strange to see it in real life. Title: Conquered rivals meet in the Springs. 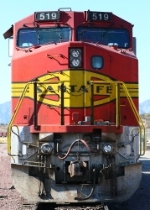 Description: BNSF 519, Ex/ ATSF Warbonnet. And UP 1490 Ex/SP are stationed in Colorado springs for Local power use. Nice to see the "original" ownered of the joint line back in town. Description: BNSF's Colorado Springs local power sits quietly downtown Colorado Springs. Description: Power for both the UP and BNSF sit idling downtown Colorado Springs. This is the first time I have seen the BNSF power here, it normally sits further south in the yard. Description: Still the Local Power in Colo. SPgs.